But we are bound to give thanks alway to God for you, brethren beloved of the Lord, because God hath from the beginning chosen you to salvation through sanctification of the Spirit and belief of the truth: Whereunto he called you by our gospel, to the obtaining of the glory of our Lord Jesus Christ. Therefore, brethren, stand fast, and hold the traditions which ye have been taught, whether by word, or our epistle. Now our Lord Jesus Christ himself, and God, even our Father, which hath loved us, and hath given us everlasting consolation and good hope through grace, Comfort your hearts, and stablish you in every good word and work. Finally, brethren, pray for us, that the word of the Lord may have free course, and be glorified, even as it is with you: And that we may be delivered from unreasonable and wicked men: for all men have not faith. But the Lord is faithful, who shall stablish you, and keep you from evil. And we have confidence in the Lord touching you, that ye both do and will do the things which we command you. And the Lord direct your hearts into the love of God, and into the patient waiting for Christ. Grace like a flame shining forth from thy mouth has illumined the universe,/ and disclosed to the world treasures of poverty and shown us the height of humility./ And as by thine own words thou teachest us, Father John Chrysostom,/ so intercede with the Word, Christ our God, to save our souls. Inspired by the virtuous example/ of our Fathers Columba and Machar,/ O Hierarch Denick, thou didst preach among the heathens of Caithness/ enduring great hardships, despite old age and infirmity./ Wherefore, O Saint, pray that worthless and useless as we are,/ Christ our God will grant us great mercy. 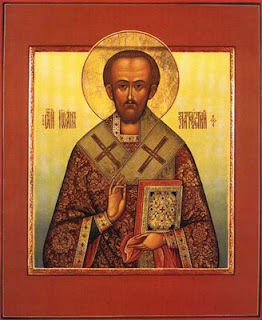 Thou hast received divine grace from heaven,/ and with thy lips thou dost teach all men to adore the one God in Three Persons./ O John Chrysostom, most blessed Saint,/ we rightly praise thee;/ for thou art our teacher, revealing things divine.